You are currently browsing the tag archive for the ‘VMware’ tag. 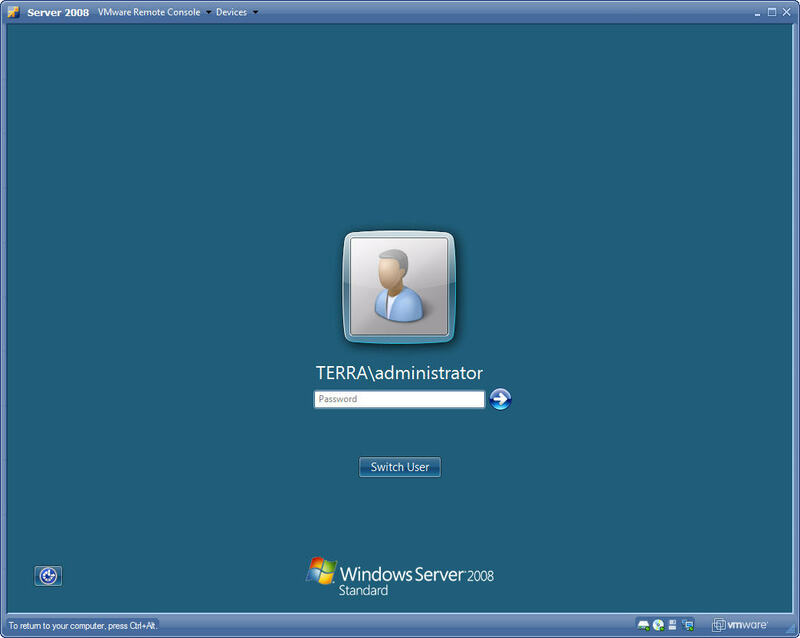 VMware Server 2.0 — Finally! Previously I was running VMware Server 1.0.6 on this system but now that VMware has released Server 2.0 I wanted to take another look at it. While the download is big (570MB) it certainly is not too bad and the install went flawlessly. The Server 2.0 detected the 1.0.6 software on the machine, uninstalled it (but kept the settings) and then installed Server 2.0 and configured it using the settings from the 1.0.6 version. All in all, within about 10 minutes I was back up and running. I like the look of the new interface as well — reminds me very much of the clean look of ESXi…and the best part is that it runs in IE8 Beta 2 (well, almost). 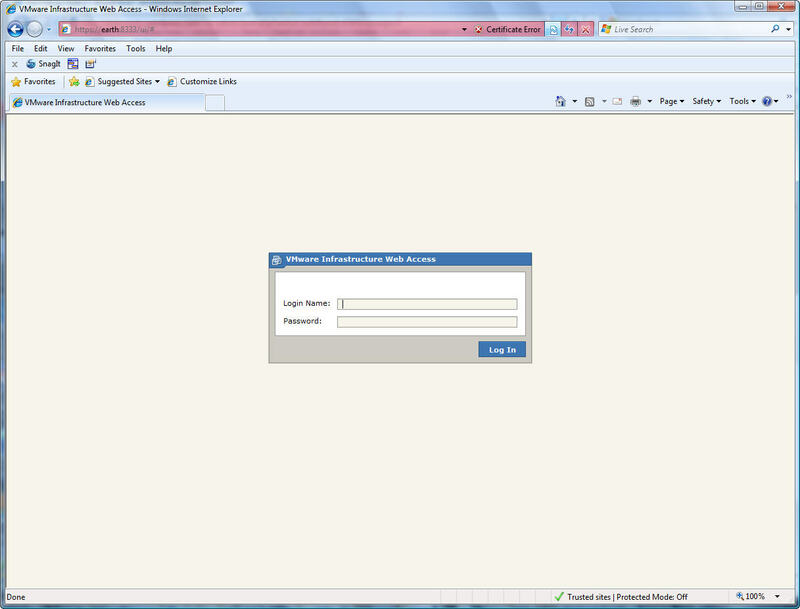 To login I simply point the browser to the host system port 8333 as shown. Once you login the amount of information at your fingertips is great. 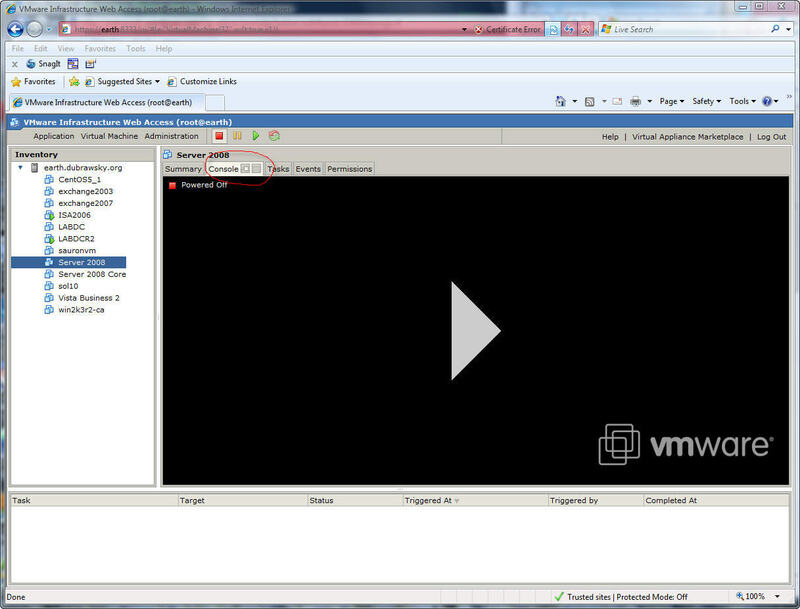 The option on the left opens up a new VMRC window as a separate window. 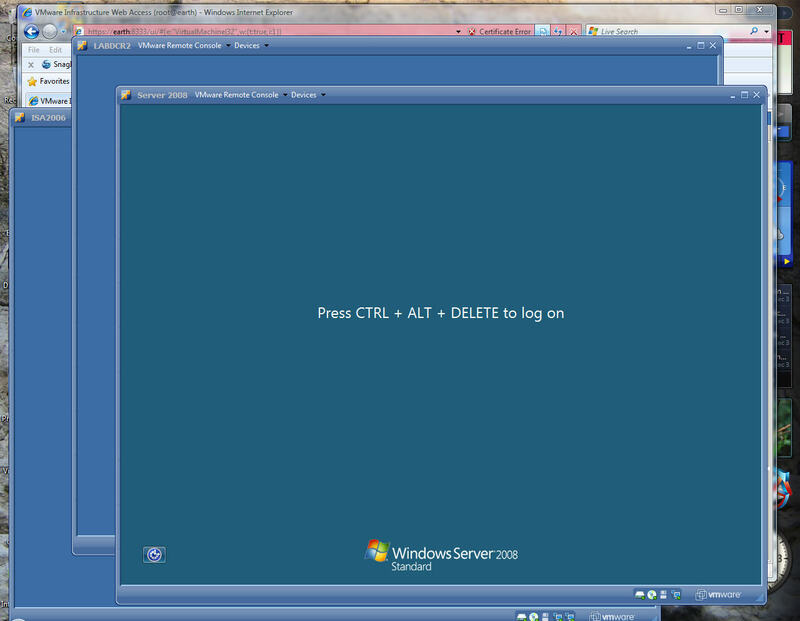 The box on the right opens the VMRC in full screen mode (which you can then reduce to a regular sized window). Not sure what the benefit of the two options are but it’s there if you need it. Once the machine starts up you can have multiple VMRC windows running just like you have with ESXi. 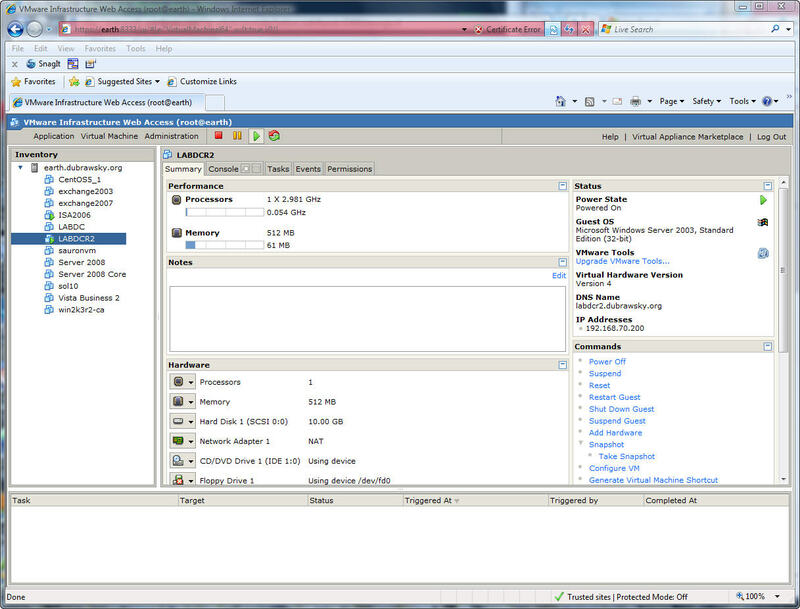 All in all, I’m quite impressed with VMware Server 2.0. I plan on playing with it for quite a while and will consider whether I will migrate this host server over to VMware ESXi 3.5. Given the small footprint of ESXi (both in terms of disk as well as memory) it may well be the way to go in the long run. 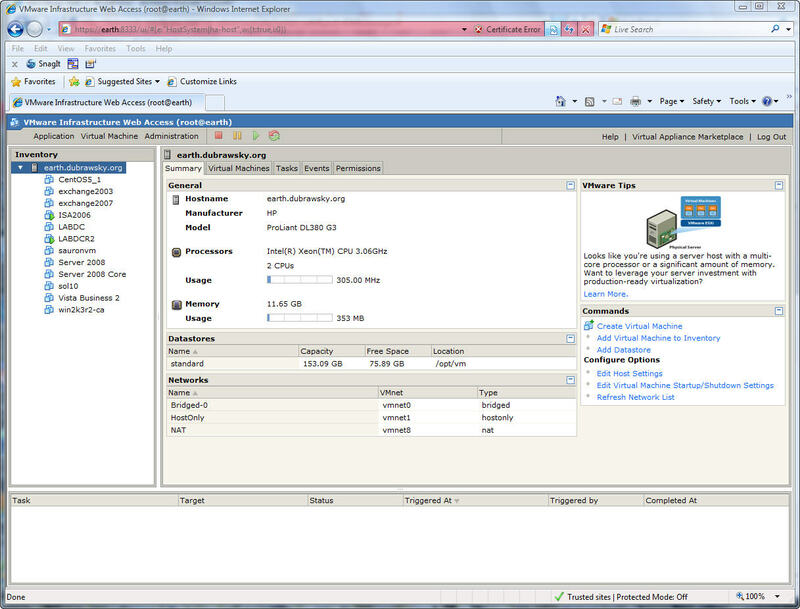 I’ll review my ESXi experience in an upcoming post as well as my Hyper-V experience as well.